Audience focus. Mass media only accesses broad audiences, whereas further down the tail highly selective niche audiences, by geography or interest, can be garnered. Advertising models. At different levels of scale, dedicated, aggregated, or combined advertising sales models are appropriate. Associated with these models are different shares of total advertising revenue. Cost of content creation. Mass media is associated with high production values, which means content creation remains expensive. Production costs are rapidly reducing, but the premium placed on creative talent means that costs will remain high. However production costs for most other forms of content has become very low. This is primarily associated with labor rather than technology costs, which can be low due to lifestyle advantages for content creators. 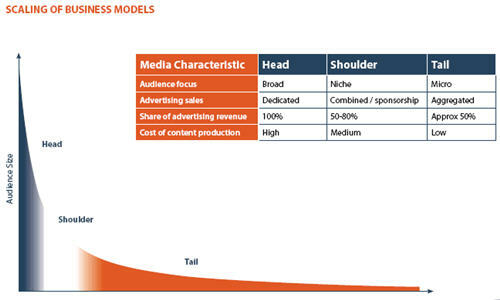 What underpins this framework is that there is no right or wrong place to be on the curve, simply that advertising or other revenue models and content creation mechanisms need to be aligned with the audience. As the other frameworks show, attracting niche audiences can result in stronger revenue relative to costs. A “multi-niche” model which is effectively monetized can be more effective than traditional mass media approaches, by allowing sharing of overheads and sales efforts across media properties, and gaining more value from highly targeted audiences. Scaling costs and overheads and extracting premium revenue is as viable a strategy as increasing audience size. 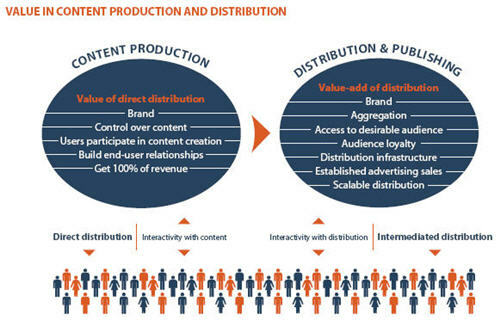 Digital channels have resulted in a dramatic fall in the cost of content distribution. This means that content creators (such as film producers, writers, or researchers) can readily distribute their content directly to their audience, if they so choose. There is substantial incremental value to content producers in direct distribution, including control over content, building end-user relationships, and not having to share revenue. As user-generated content grows as a factor, a significant issue is the ability to have users engage directly in the content creation process. However there remains real value in the distribution process. Distributors such as broadcasters, publishers, and agents will continue to play an important role in the media landscape, as long as they can effectively establish and build distinctive value-add, including brand, aggregation, scalable infrastructure, and the ability to attract desirable audiences. The landscape of value creation in content production and distribution will continue to evolve, leading to ongoing strategic choices for content producers and distributors in the partners they choose to work with. There will always be a role for paid content, through subscriptions, pay-per-view, and other mechanisms. However the broad trend is that content creation is increasingly supported by advertising. This is becoming more viable as differentiation emerges in the value and pricing of advertising. Advertising in mass media is priced largely by audience size. 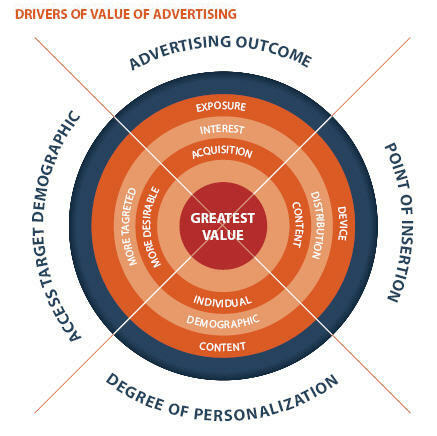 There are four additional key drivers of the value of advertising. As the ability to refine these drivers increases, substantial revenues will become possible, even from relatively small audiences. Advertising outcome: The original concept of advertising was exposing an audience to messages. However advertising can now be linked directly to the audience taking action through expressing interest or making buying decisions. Access target demographic: Accessing generic demographics that are highly desirable such as CEOs increases value for most advertisers. However some advertisers are looking to access very specific profiles. As it becomes possible to target these niches, advertising value increases. Point of insertion: Advertising used to be inserted solely in distribution channels: for example in newspapers or between TV programs. A multiplicity of new approaches to inserting advertising are emerging, including on the end-user device such as the mobile phone, or inside content itself, as in for example product placement or “advergames”. Personalization: Personalization is one of the strongest drivers of advertising value. 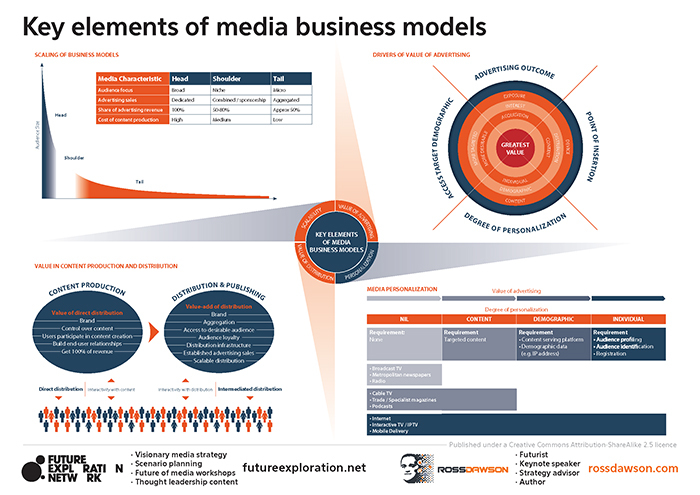 This is covered in more detail in the Media Personalization framework. Personalization is a large part of the future of media. Yet to enable personalization of content and advertising, there are multiple requirements including compiling data about audience members, and content serving platforms that allow content and ads to be altered on the fly depending on the viewer. 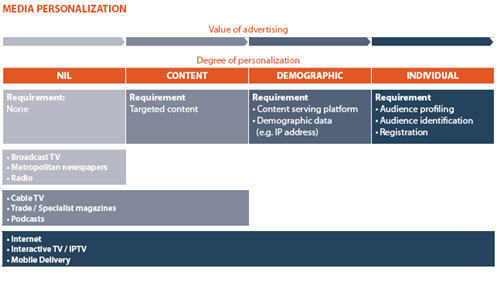 There are four levels to personalization of content and advertising, each of which leads to increased value. Nil. Most content and advertising is not personalized. It is not currently possible to personalize content on mass distribution channels such as broadcast television and newspapers. Content. Personalization is possible by being associated with audience-specific content. Trade magazines or targeted cable TV channels, for example, attract particular audiences, effectively enabling personalized advertising. Demographic. Advertising and content can be personalized for a particular demographic, such as gender, age, or location. This requires being able to match viewers with a profile, which can be generated for example by cookies or Internet Protocol address. Individual. Personalization for the individual requires both audience profiles, possibly generated through a registration process, and the ability to identify audience members individually. Online and mobile content delivery or interactive TV are channels that enable individual personalization. Yahoo!’s recently launched SmartAds initiative is primarily about individual-level personalization. It is important to note that, even if the distribution channel being used enables higher levels of personalization, there are a range of other requirements for personalization. These are often still not fulfilled.